Size Choose an option1-1/2oz & 2oz.1/2oz, 3.4oz & 1oz3/4oz & 1oz.3oz & 4oz. Fin-tech tackle Company is proud to introduce the latest addition to its line of innovative fishing products, the Tech Bouncer “EZ Weight Change” System. The Tech Bouncer features include a patented EZ weight change system, stainless steel components, Ball Bearing Swivel/Tournament Snap and an Innovative Double “R” bend line tie. Regardless of line or sinker tension your line will never slide out of the bend! Trolling or drifting the Tech Bouncer runs snagless on the bottom over any structure or in open water at any depth. 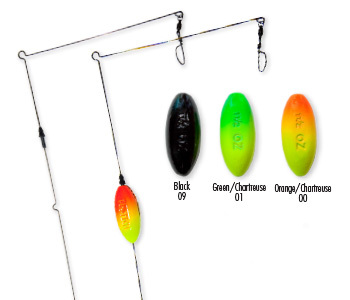 The EZ Weight Change system allows you to change depths fast and easy without retying the entire rig. This means LESS RIGGING – MORE FISHING! 1-1/2oz & 2oz., 1/2oz, 3.4oz & 1oz, 3/4oz & 1oz., 3oz & 4oz.